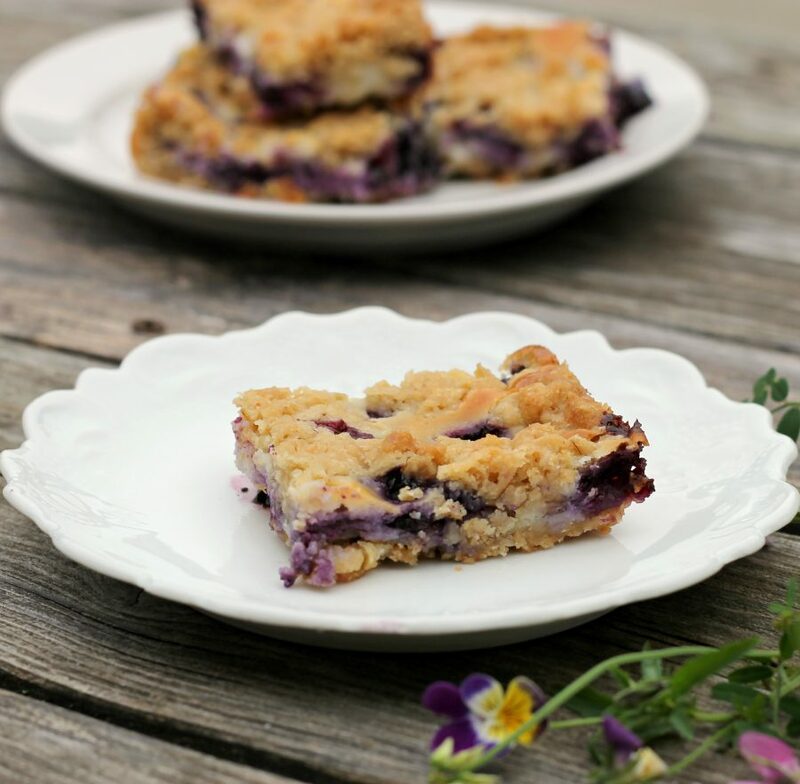 Blueberry cream cheese bars, a sweet fruity bar that is sure to please any sweet tooth. Yep, another blueberry recipe, I know the second one this week. I love blueberries and since they are in season and cheap in the grocery store, I just can’t resist. Before you know it the blueberries will be just a sweet memory and we will have to wait until next summer. I made these bars for my brother’s birthday party last week. If you know me you are thinking… where is the chocolate? Well I will tell you I did take another pan of bars to the party that were chocolate. But these blueberry cream cheese are just as yummy as any chocolate could be. 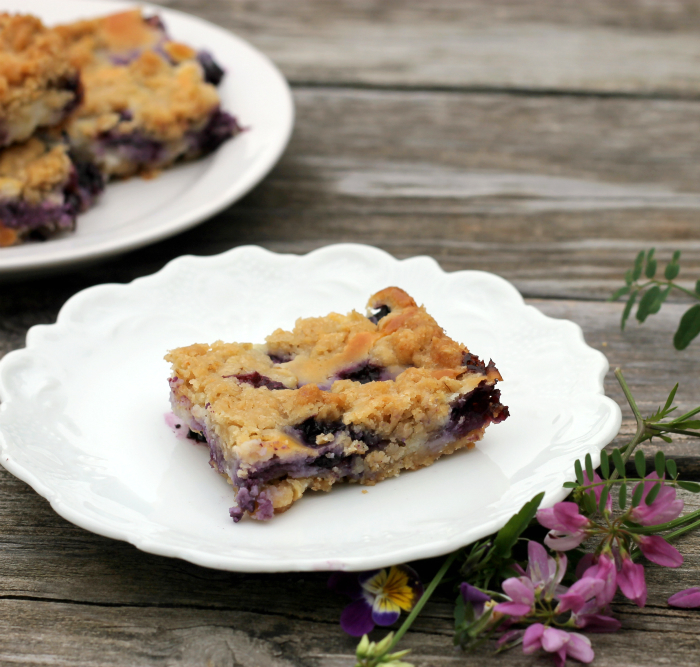 The bars are made of a sweet crumble crust topped with sweetened cream cheese with the blueberries folded in and then topped with some reserved sweet crumble crust. It all comes together to make one incredible bar. If you don’t like blueberries I am sure that you can substitute other summer fruit. Oh, I think that peaches would go very nicely in this recipe. But really if you are a blueberry loving type of person you really need to try this recipe. Combine the flour, sugars, salt, and oats mix together. Add the butter and by fork or hand mix the butter with the dry ingredients until well blended. Reserve 1 1/2 cups of the oats mixture for the topping. Press the remaining crumbs into a greased 9 by 13 cake pan. Place this in the oven and bake for 10 to 12 minutes or until set. While the crust is baking, prepare the filling. Beat the cream cheese and the sugar with an electric mix. Add the egg and almond extract mix until blended. Fold in the blueberries. Once the crust is done baking remove from oven. Spread the cream cheese mixture over top of the crust. Crumble the reserved oat mixture over the top of the filling. Return to the oven and bake for another 30 to 35 minutes until the bars are lightly browned. 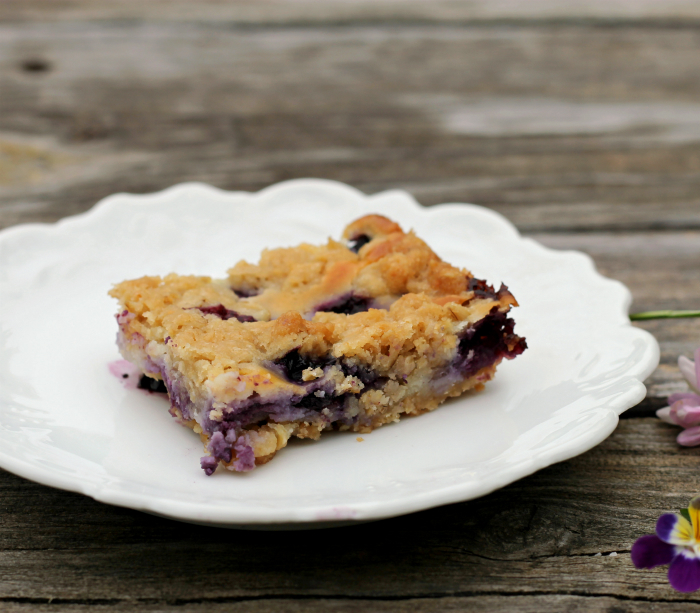 I am quite blueberry obsessed lately…these bars sound perfect! Blueberries and cream cheese sound absolutely delightful paired together! I am one of those blueberry loving people and my mouth is watering over these! They look positively scrumptious! Especially with cream cheese oats. My favorites.